 Useful attempt to identify the writers and activists of the 1940's and 50's who most influenced progressive thought in the 60's. 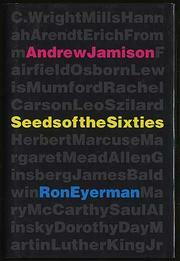 Seeds resurrects the contributions of 15 people, many now forgotten, whose work underlay the radical activism of the 60's (see Farber above). The 60's can't be explained without a look at the influence of such partisan figures, the authors (Lund University, Sweden; Social Movements, 1991, etc.) insist. They're right: Seeds is a useful corrective to the notion that 60's activism arose in a vacuum (the vacuum the 40's and 50's are often assumed to have been). The authors' choice of figures is salutary. They include ``insider-activist'' ecologist Fairfield Osborne, who reinvented the zoo as a site of environmental education; Lewis Mumford, whose writings on literature, technology, and the urban environment opened crucial lines of theoretical inquiry; Leo Szilard, who conceived the atom bomb and then fought against those who controlled it; and Mary McCarthy, whose frank and satirical writing about women's lives developed the kind of consciousness that led to the women's liberation movement. The book also includes a number of figures too-long neglected--cultural theorist C. Wright Mills, Marxist psychoanalyst Erich Fromm, activist ecologist Rachel Carson, community organizer Saul Alinsky, Catholic Worker founder Dorothy Day, and philosopher Herbert Marcuse. Inevitably, these activists had their own antecedents. Discussion of such forerunners (Dewey and Emerson among them) helps underscore the existence of a long progressive tradition in American thought. The book's chief drawback lies in its formal structure--introductory material tends to dryness; chapters are closed by repetitive summations; material on the figures themselves tends to get squeezed out (the section on Martin Luther King, for example, is woefully short). The authors might have done better to weave their own observations into writing about the figures, making this collective biography more truly collective. Still, Seeds of the Sixties serves a crucial purpose; hopefully it will lead readers to further investigate the work of the important and interesting figures it examines.